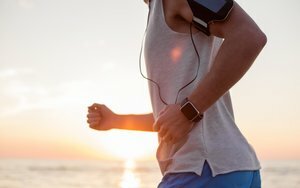 The world of wearables leans toward fitness trackers, although overall adoption of both seems to be low in the U.S.
By the end of last year, fewer than a quarter (16%) of consumers in the U.S. owned a fitness tracker or smartwatch, according to new numbers from Kantar Worldpanel ComTech. Of wearables sold in the fourth quarter of last year, 35% were smartwatches. Half (50%) of those were made by Apple, followed by Samsung at 17%. The fitness tracker market also has a clear leader, with Fitbit holding three quarters (75%) of fourth quarter sales, followed by Garmin at 12.5%. The rest of the fitness tracker and smartwatch market is fragmented among smaller brands, according to Kantar Worldpanel ComTech. Although Fitbit led the fitness tracker market in fourth quarter sales, the associated revenues were lower than expected. As a result, Fitbit plans to cut about 6% of its workforce, or 110 employees, to reduce operating costs by $4 million this year. “While we have experienced softer-than-expected holiday demand for trackers in our most mature markets, especially during Black Friday, we have continued to grow rapidly in select markets like EMEA, where revenue grew 58% during the fourth quarter,” James Park, co-founder and CEO of Fitbit, said in a statement. “We believe the evolving wearables market continues to present growth opportunities for us that we will capitalize on by investing in our core product offerings, while expanding into the smartwatch category to diversify revenue and capture share of the over $10 billion global smartwatch market,” Park said. However, general interest in wearables seems to be low. More than three quarters (76%) of consumers in the U.S. who don’t currently own a wearable said they don’t plan to purchase one within the next year, according to Kantar. Almost half (46%) listed price as a reason for not purchasing a wearable and a third (33%) said they don’t find them useful.